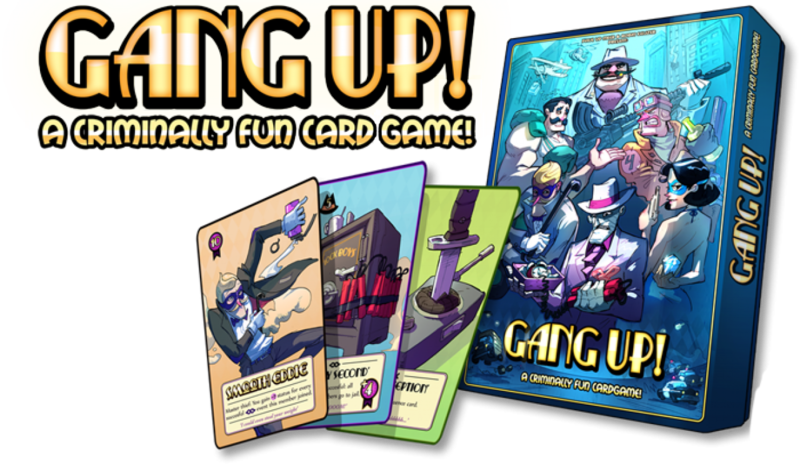 This is the first version of Gang Up! The game contained 110 basic cards, plus additional ‘Gang leader’- & ‘Location’- cards and several customizable cards. These were added as a bonus after a successful Kickstarter campaign. The advised price was € 15. Q: When can I use my Gangster actions? A: You may use the gangster actions when they are in your HQ or in a crime, as long as you can pay the cost. If they’re forced at a crime by another player, then that player can use their actions. Q: When do the Gangster traits apply? A: Gangster traits automatically apply when relevant. Sometimes that’s during the crime phase; like when your gangster gives a +2 status bonus when a crime is successful. But there is for example Franklin, who automatically kills every gangster that defects from your gang. This trait can activate when Franklin is in a crime or in your HQ. Q: Takeover Todd allows me to use Gangster from jail as though I had them in my HQ. Do I discard two cards per jailed gangster I want to use? A: No, when you discard two cards, all members are considered to become part of your gang. When I use jailed members through Takeover Todd, Can I use both their abilities and use them as manpower? A: Yes, you can use those gangsters just like your own HQ-gangsters during that turn. They just go back to jail at the end of it. Q: If two players successfully complete a Crime, both get awarded the Status points. But if the Crime card has a bonus effect (f.i. draw a resource card) is that also awarded to both players? Or only to the player who’s turn it was? A: Both players get the reward mentioned on the crime card, that includes the extra resource card. But if you get an extra bonus through one of your gangsters traits you don’t share that. Q: When does a gambling crime fail exactly? And do you get more status if you add more manpower during the crime? A: The gambling crime fails if you end up with less manpower than the amount you started the crime with. Adding more manpower with an Influence card during a crime only serves as a buffer, it does not increase the amount of status. Q: The Headhunter seems really good: defect any character at the cost of a single card? Am I missing something here? A: The Headhunter is a very powerful card, especially when played in a clever combo (such as with the mayor). Although he is less useful when the other gang has either Franklin or Dinsdale and useless if you have Intimidator or play as Black Lotus. Also he can be killed by Sheryl or Wyatt. So there are ways to stop him. Q: Does Wakowski cancel 1 arrest, or 1 arrest Influence card? A: He stops them all, even if the Influence card mentions multiple arrests. Q: When my Gangsters are ‘forced to join a crime’, who can use the Gangster actions and who benefits from gangster traits? A: When members are forced to join a crime another players started, consider them as members of that gang until the crime is over. The forced members return to their original gang after the crime is completed (if not otherwise affected). Temporarily moving gangsters to and from a gang when forced, does not count as ‘defecting’. Q: When my Gangsters are ‘forced to join a crime’, can I still benefit from cards that give me extra status points after the crime – like ‘Nine o’clock news’ ? A: No, when someone forces your gangsters you can consider them temporarily belonging to that gang. Q: When a gangster is forced to join in a gambling crime, does the manpower needed increase? A: Yes, you can only add Gangsters to a crime before it starts (unless you use an Influence card). And since the manpower at the start of a crime determines the required manpower and Status reward, both increase. A: If you play ‘Police Presence’ before a gamble crime starts; the player needs at least 3 Manpower to play the gamble crime; but he can still add more if preferred. Also; the status reward wil at least be 3 in this case. If the ‘Police Presence’ is played during a gamble crime, the player needs to add 3 extra manpower to let the crime be successful. But these extra man don’t increase the status reward anymore. Q: Can I play Failed Partnership if only one gang participated in the crime? A: There need to be 2 gangs in a crime for Failed Partnership to work. can’t pick another ally during the crime. Of course, if your ally decides not to help before the crime starts, you’re free to pick another ally. Q: One of the crime cards is a trap, that forces players to discard Gangsters, that are then arrested. Can Lizzy 9 Lives be arrested in this way? If no, what happens if you choose to discard her: does she go to the discard pile? Or do you keep her? What happens if you have Mayor Winston? A: Lizzy 9 Lives is immune to the Trap. And the Mayor protects the others in that HQ. Q: Does “Busted Siren” completely cancel “Police Party”, or does it only prevent the arrest of 1 gangster? A: “Busted Siren” cancels the entire “Police Party”. Q: When we can pick up a gangster who’s in jail, can we pick up any gangster or just the one at the top of the pile ? A: You can go through the pile. Q: If I have The Copycat copy Vengeful Frank, are those cards killed if they try to defect? A: Frank doesn’t kill himself when he defects. And Copycat takes over the exact properties of whoever he copies. So, Frank doesn’t kill Copycat or vice versa. You could reason that Frank should realize that his double is trying to defect and not himself, but for now let’s assume Frank is a bit dim. Q: Can my opponents pay 2 cards at any time to have Herc the Merc defect? Even after the crime is in progress, or after it is completed? Same question for Easy Jenny. A: Yes, both cards have their value, but you run a big risk if you do a crime with those two gangsters and didn’t bring more than the minimum manpower required. Because they can be defected during a crime. Q: After a failed crime, does ‘the Magicians’ effect trigger before or after the status decrease? This matters because if the status decrease causes gangsters to return to the player’s hand, they are discarded if the gang leader’s effect triggers last. A: The results of the crime are handled first. So if you lose status and are forced to take some gangsters back to your hand these gangsters go instantly back. And then your hand is discarded. Q: Do I have to discard cards to buy/sell a Location card? A: No, we made a typo in the rules, sorry! You don’t have to discard cards, you only use status points as a currency here. Q: If I count the cards listed in the rules (under ‘Box Contents’) I count 131 cards. Do I miss a card? A: Nope. The game contains 130 cards, as listed on the box. But we made a typo; the expansion version contains only 5 additional gangster cards, not 6. Q: I made a boo-boo and lost so many statuspoints I ended up below 5 Status. What can I do? A: In order to bring you back into the game, you can add one Statuspoint at the start of your turn until you reach 5 Status again.